Extreme magnification reveals the unique columnar grain structure of the EXO coating. The body of the nodules provides a large surface area to dissipate heat, while their convex tips minimize the contact area that can generate friction. EXO is typically applied at a thickness between 10 and 100 microns. Coating thicknesses as high as 800 microns are possible, depending on the application. Regardless of the depth of the coating, the surface of the component remains remarkably smooth and uniform. 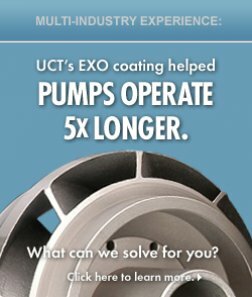 UCT’s patented Nickel Boron plating, known as EXO, creates a competitive advantage across many industries and applications. Our Nickel Boron has a higher boron content than any other commercially available NiB. That results in increased hardness and wear resistance. Parts coated with our Nickel Boron run longer and require less maintenance. The coating greatly enhances heat dissipation so treated products run cooler than non-treated parts. EXO is a patented, nodular Nickel-Boron (NiB) surface treatment. The coating nucleates on the surface atoms of metals, becoming part of the metal rather than merely applied to the outside. In addition, the treated surface becomes harder than the substrate itself, eliminating the cost, weight and degradation problems of conventional hardened metals. EXO Nickel Boron is appropriate for virtually any application where reduced friction, extended service life, enhanced performance and lower maintenance are desirable. UCT technology applies a Nickel-Boron (Ni-B) family of coatings to metal alloy surfaces. The properties of these coatings make them suitable for applications requiring high wear resistance, friction reduction, uniformity of dimensions on complex geometry, strong adhesion to substrates, and inherent solid lubrication. Corrosion inhibition is an added feature. Benefits include increased life cycle and decreased maintenance costs. The application process is non-line-of-sight, low temperature, industrially attractive, scalable, transferable, repeatable, and available now. The surface finishing techniques developed by UCT Coatings utilize an autocatalytic deposition process by submersion of the part in a liquid bath. The processing parameters and chemistry used by UCT Coatings are proprietary and patented. UCT Coatings processes are able to achieve optimized levels of boron, between 5-6 weight %, in the coating. This fact, combined with a much improved microstructure compared to other Ni-B coatings, sets UCT apart from its competitors, including all other Ni-B coating suppliers. Nickel Boron plating is not a line-of-sight technology. EXO coats parts with an even thickness including inside and outside corners and blind holes, ensuring uniformity of properties on all surfaces. The rate of plating deposition is well-known (0.0008 in/hr, 20 microns/hr) and well-controlled, providing a high production throughput rate. 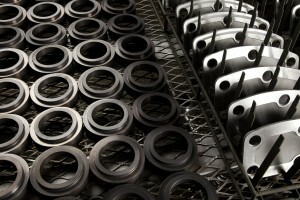 The entire coating process can be scaled and automated as needed to accommodate most sized parts. Post-plating processes may include a variety of surface finishing techniques. A precipitation hardening cycle transforms the as-plated amorphous nickel-boron plating to crystalline Nickel Boride (Ni3B) resulting in an increase in hardness typically >1300 Knoop. Additions to the Ni3B coating can alter and enhance properties in severe and very demanding applications. Components coated with EXO Nickel Boron can be stripped and re-coated to restore critical dimensions and functionality, saving components that are expensive and/or difficult to fabricate. Similarly, designs that incorporate other coatings can usually be stripped of those coatings and UCT Coatings Nickel-Boron plating can be applied to boost performance. UCT Coatings also provides nickel phosphorous (Ni-P) coating services that meet and exceed industry standards. We provide both mid and high Nickel-Phos and we can coat almost any alloy. Our engineering team can help you develop the right Ni-P solution for your application, including appropriate processing steps and quality controls. Contact Us or complete our online Info/Quote Request form today!